Deputy President William Ruto has promised Kenya Sevens Rugby team “Shujaa” “improved facilities” and a “rigorous” high volume training to keep the players in shape. Ruto addressed the World Cup bound team Friday morning when they paid him a courtesy call ahead of the global showpiece slated for San Francisco, USA from 20 to 22 July. The team leaves for USA on Sunday morning and will play their first match against Tonga at 11:01 PM Kenyan time on Friday 20 July. “The country is proud of you as our sports ambassadors and placing Kenya on the world map. The government will ensure improved facilities and vigorous, high volume training to keep the players in shape,” the DP said. 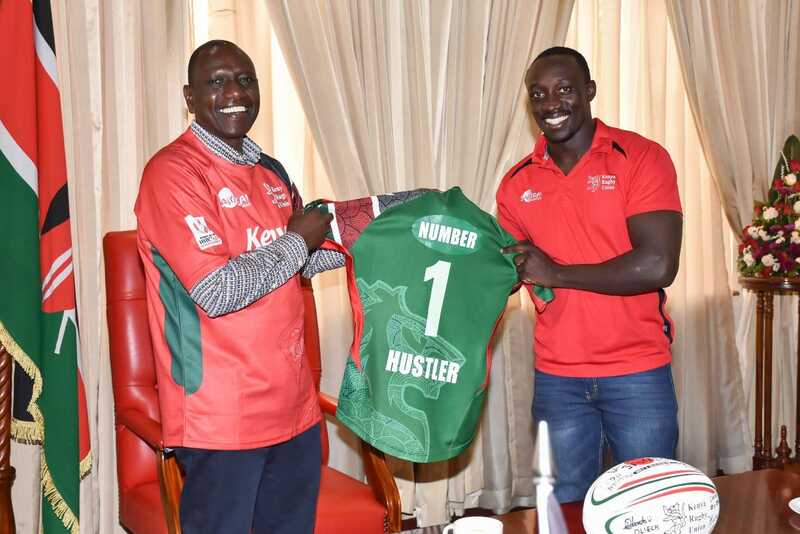 He was presented with a signed rugby ball by the head coach Innocent Simiyu and a jersey written “Hustler” on the back. Kenyans will recall that the government is yet to deliver a campaign pledge to build five modern stadiums across the country. Despite Shujaa’s exploits at the world stage, the team has had to endure perennial problems of unpaid allowances and salaries as politicians bask in their glory.